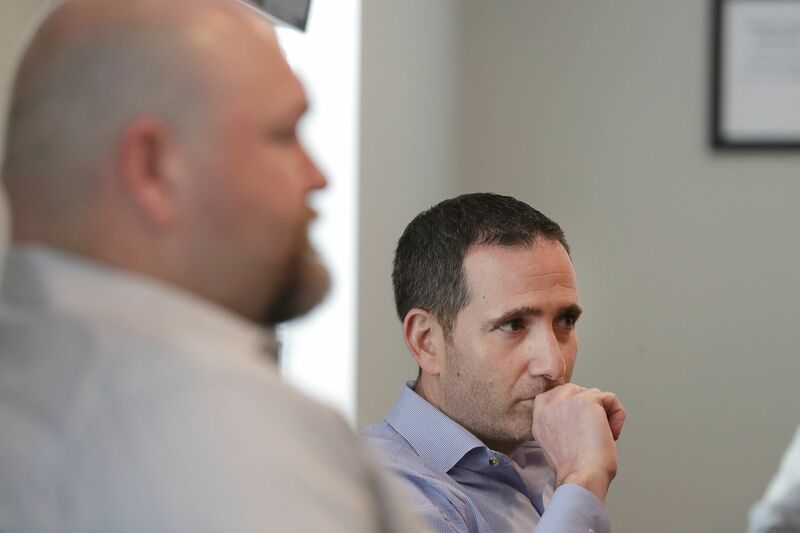 Howie Roseman (right) and Joe Douglas dished on their draft plan on Tuesday. In past years, top Eagles executive Howie Roseman has identified a cutoff for the top talent in the draft – and it’s usually before No. 25, where the Eagles are set to pick in the first round of next week’s draft. While Roseman is happy he’s not drafting in the top 20, he also knows there are not necessarily 32 “first-round” players, even if there are 32 first-round picks. However, Roseman would not identify where the drop-off is this year. When asked about the depth in this year’s draft class, Roseman and Joe Douglas, vice president of player personnel, said it depends on positions. For instance, this is considered a deep defensive-line draft class. (Roseman called it a historically deep class in January.) The Eagles might find a player in the top 20 who would be one of the best defensive linemen in a different year. The Eagles’ brass did not go into weaknesses of this class, but there’s not as much top-level talent at running back and not as much depth at linebacker as in other years. Roseman reiterated the organizational emphasis of building along the line of scrimmage. He has spent six of his seven first-round picks as the decision maker on offensive linemen or defensive linemen/edge rushers. Identifying the cutoff point is key because Roseman, who has earned a reputation as one of the NFL’s most aggressive executives, will be nimble at No. 25. The Eagles can trade up to the teens where they’ve found top-level talent in the past -- such as Brandon Graham and Fletcher Cox -- if they feel the board is close to reaching that cutoff point and they were willing to surrender multiple draft choices. They’ve also shown the willingness to trade down if they feel the board is crowded with players who share similar grades; this is what they did last year when they traded out of the first round and landed tight end Dallas Goedert in the second round. That deal gave them an extra second-rounder this season. When asked if he’s more apt to trade up or down this year, Roseman responded, “Who’s on the board? What’s the value?” This should suggest the Eagles are willing to go either way. What helps the Eagles is that they don’t feel they have any glaring needs on their roster. Fans who look at the linebacker depth chart might suggest otherwise, but the Eagles believe they do not need to plug any holes in this draft. That allows them the flexibility to take the best player on the board, and it could very well be a high-level player who drops. If there’s an early run on quarterbacks in the top 20, the Eagles could be the beneficiaries of landing a player pundits didn’t project at No. 25. The Eagles patched their hole at running back by acquiring Jordan Howard. They’ll still be in the running back market, though. Roseman rejected the notion that he doesn’t value the position, pointing to the success the Eagles had with top running backs such as LeSean McCoy. (McCoy, by the way, was a second-round pick.) But he also noted that the Eagles have won with a running back committee, and they’ve been burned in the past by taking a running back because they felt needed one. The Eagles have a roster that will be considered among the top in the NFL entering the season, and finding contributing players with their top three picks will only enhance the depth chart. Roseman said the Eagles can’t necessarily view it that way, citing 2002 when they picked cornerbacks Lito Sheppard and Sheldon Brown in the first two rounds. Those two didn’t play much as rookies, but they did on an NFC champion in their third season. Still, the opportunity will be present for the Eagles next week.